If you asked anybody living in Marietta, GA, to name a landmark, there’s no question that The Big Chicken would be the first one off their tongues! Even before I had ever stepped foot in Marietta, in fact, I had heard of The Big Chicken. Not long after moving to the Atlanta area, a friend and I made a pilgrimage out just to see and eat inside The Big Chicken. Thus some years later when I began my series of Landmarks in the Atlanta area, I had absolutely no question that I would be heading out to Marietta to capture that Cobb Parkway icon. Not only wasn’t it my first time visiting it, it was not my last. 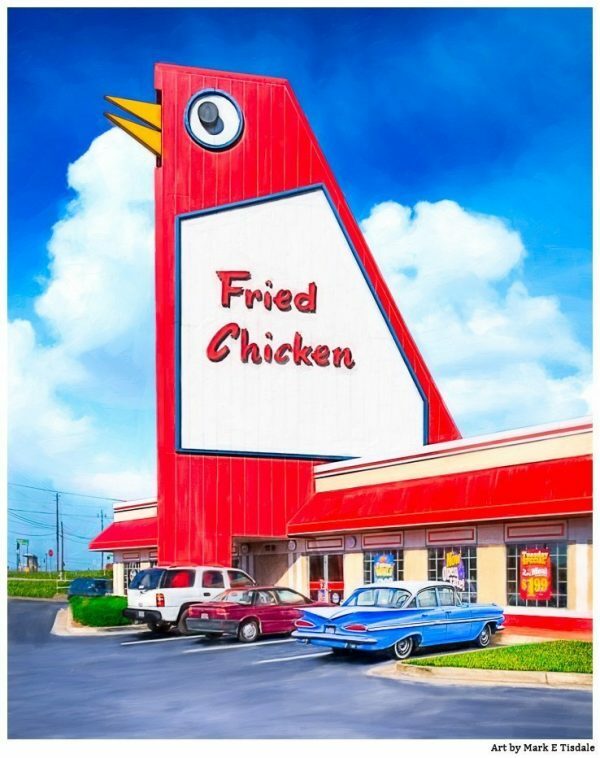 If you have any love for kitschy roadside Americana, then The Big Chicken in Marietta, GA, has to be in the pantheon of quirky cool roadside art. If you’re not familiar with Marietta, GA, but you’re looking for prints for a friend who is from there, then you may be looking at this Marietta print with a puzzled expression on your face. You see, The Big Chicken is an institution. It originally opened its doors as Johnny Reb’s Chick, Chuck and Shake restaurant in the 1960’s. By the 1970’s it had become part of the KFC chain. 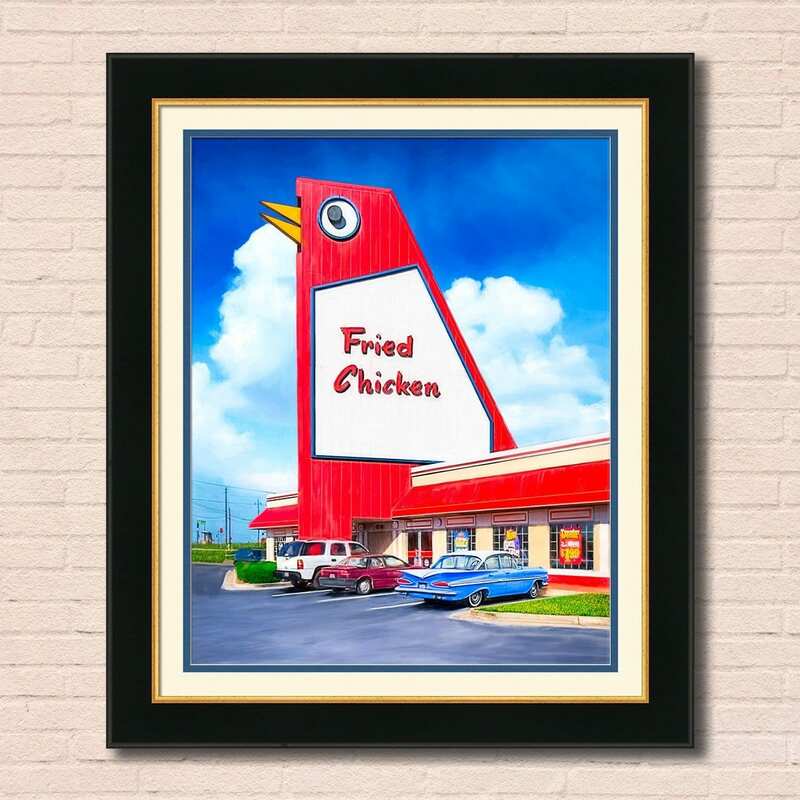 Over the course of the years, The Big Chicken has become something of a directional waypoint in Marietta. Ask someone for directions, and they’re very likely to tell you how to get there starting from that giant metal chicken! In Marietta, apparently all roads do lead to The Big chicken. This is a landmark that is so loved by locals that when the structure was damaged in a storm in 1993, there was a public uproar when tearing it down was suggested. The landmark seems to be safe from such threats today having been rebuilt and renovated more than once since. In metro areas like Atlanta, there are few constants, but it looks like this is one! 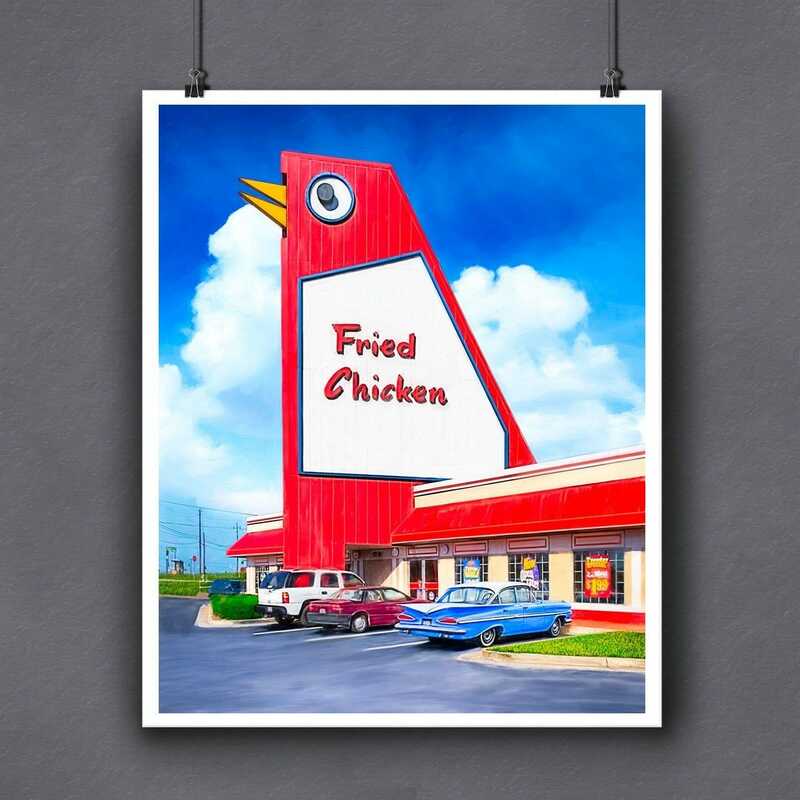 Over the past decade, this Big Chicken Print has been one of my most popular. 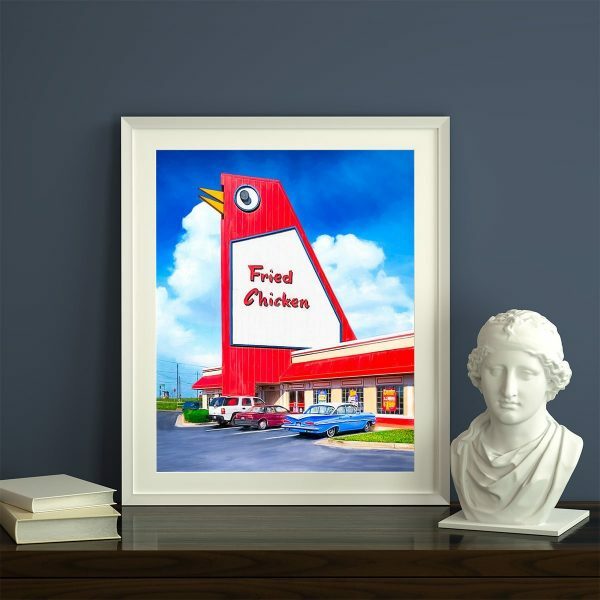 I suspect most who find this Marietta, GA, print are looking specifically for a Big Chicken print to show their love for Marietta. But it’s also possible some of those prints went to people who simply love the quirky retro vibe of this 20th century roadside attraction. It is an impressive piece of Americana, after all. I hope you’ll take a moment to leave a comment and share your memories about The Big Chicken in general as well as your thoughts about this Marietta, GA, print. What drew you to the artwork? The deep primary colors? Reminds you of Marietta? Or give your own answer – I’d love to hear it! This Big Chicken print is available as a fine art print ready for framing, framed wall art, canvas prints, metal prints, and more. You can see all the options available for this print by clicking through to the shop above. And if you have questions about any of the print choices for this Atlanta area print or other questions, please feel free to send me a message.